This has probably been asked before but I couldn't find a general thread on him so here goes. I am moving into the SF realm now and really enjoying it with the likes of Iain M Banks, Neal Asher and Peter F Hamilton. I was wondering how Alistair Reynolds fairs against these powerhouses of modern SF/Space Opera? Are his books stand-alone so I can pick anyone and dive right in? Maybe someone can post a bibliography? The only thing I am "worried" about is that some like his work and others don't. What do you guys/gals recommend? I've read no more than a short story by Reynolds (which I liked) but I plan to read "Revelation Space" at some point as I understand it is highly regarded. Don't read those three out of order. Which take place before the events of the main sequence (The Prefect, tho published later is the earliest in terms of internal chronology). Century Rain is another of his non-Revelation-Space novels. 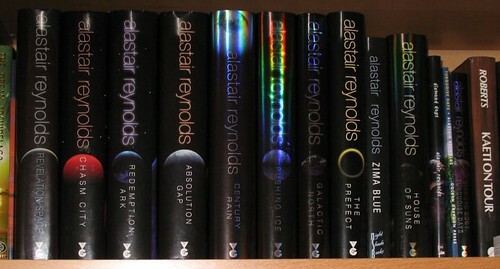 By the way, he's called Alastair Reynolds, not Alistair Reynolds. Revelation Space started out promising but the plot fell apart about halfway through and then it was just a mad dash towards a terrible ending. Highly, highly overrated. Pushing Ice, the only one I've read, is three separate books (not by intention! ), one after the other. And about as believable as a bright-blue turd. I read Revelation Space a couple of months back and thoroughly enjoyed it. I don't agree with Shadow9d9 about the plot - it all made sense to me and had a great build up to a satisfying end. I've been a lurker on here for a while, posting rarely, but saw this thread and loved the book so much I had to recommend it. Obviously he's not to everyone's taste - very few author’s are. Given that you have enjoyed Banks, Asher and Hamilton I think there is a pretty reasonable chance that you will enjoy Reynolds. If you want a "stand alone" starting point, go for The Prefect - I think it’s his best work so far. Personally, i really rate Alastair Reynolds stuff. Especially his Revelation Space books and i have to agree that i thought the RS story was a strong one. A great story, great concepts interesting factions, some great characters and interesting enough to make you wonder about their pasts. But each to their own. I'd suggest getting Revelation Space and see from there. Chances are that if you like Banks, you'll like Reynolds. He hasn't written anything in the RS universe for a while now and i for one am really hoping that he returns soon. Thanks a lot guys, I found Century Rain. Any good? It's a detective noir and SF action in one book. If you like those elements you should like this book ... I did. Thanks Taltos, I am still in the middle of a Dean Koontz book but will maybe go in after I am finished it. Ah... but are they signed? The story I read was called "The Fixation" and it was very good. Sorry, I didn't mean to compare him to Banks but more like the genre the modern SF writers write in. See, now i enjoyed Century Rain, but didn't rate it. Chasm City is superb though and i think that it's probably a pretty good start in to the RS Universe. Try it Biodriod and let us know what you think.